One of our most loved events is the Raw-Gig. This is where we combine the rawness of nature with music. We invite musicians and give them a platform to play in a different ambience. Our stage is often in the form of a natural rock table and the backdrop is a mountain range with the sunset painting the horizon red. The view from the stage is not limited to the audience but looks over a valley or open grasslands stretching in between hills and forests depending on where you are. For any musician an ambience like this will bring out the best and its quite possible that the surrounding nature will blend in with the music. Imagine sitting in a cave and listening to acoustic music that blends in with the quiet peaceful atmosphere, with no sound and light effects to enhance the music other than the light from a bonfire throwing dancing shadows on the cave walls. This mesmerizing experience is open to any one who would like to become a part of the audience or the performer. 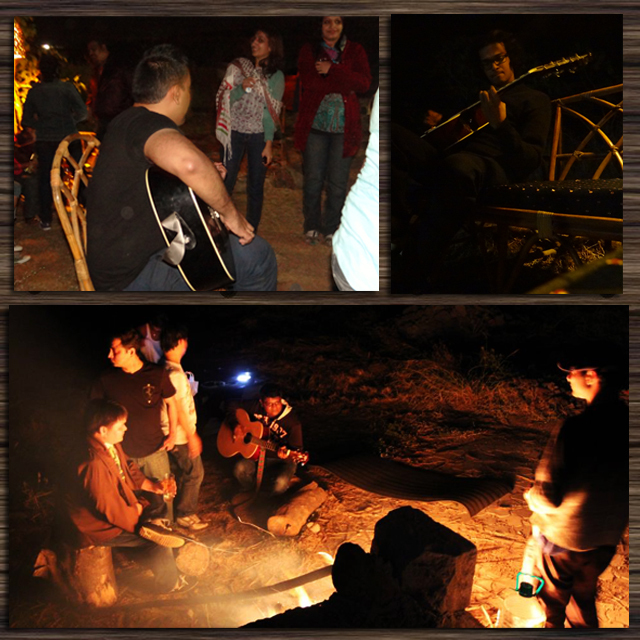 We also invite some rural musicians to unite them with the city folks and the outcome is well worth the time spent. The set up is beautiful within itself therefore we don’t see any need to increase the volume electronically; furthermore it also helps to keep the music limited to us and not get the forest and her children affected by the sound.